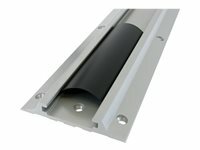 The Wall Track mounting system is a flexible, low-cost mounting method that occupies zero floor space. The Wall Track system brings computer equipment to the point of use without sacrificing valuable workspace.Wall Track provides a common interface for mounting multiple Ergotron components. Channel cover, wall track 26"